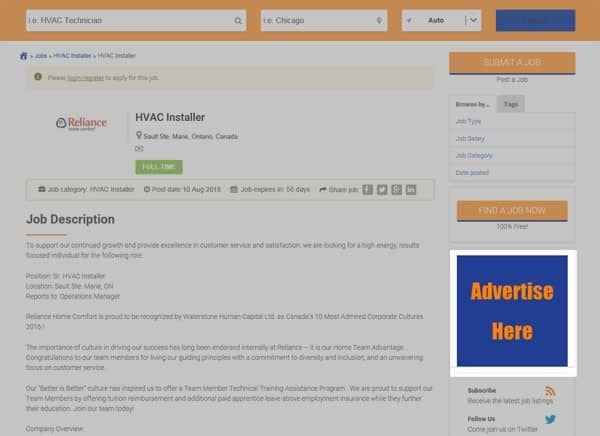 Advertising on HVAC Jobs Center couldn’t be simpler. We use a fixed cost ad rotation system. All you have to do is purchase your ad at a fixed price for one month or one year, upload your banner and enter the address where you want to redirect people who click on it. A maximum of 10 ads will rotate in two spots. Most visitors check out multiple jobs and/or pages, so most will see your ad at least once. You will receive weekly statistics telling you how many times your ad showed and how many times people clicked on it. Last but not least, you can update and change your ad as many times as you like.